Hardik Pandya and KL Rahul on Tuesday gave their statements to BCCI CEO Rahul Johri, initiating the inquiry into their much-condemned comments on women that have split the Committee of Administrators (CoA). It is learnt that both players deposed via telephone after having tendered unconditional apologies in reply to the fresh show cause notices issued by the BCCI. Hardik Pandya and KL Rahul, suspended for their controversial comments during a TV chat show, have already tendered “unconditional” apologies on Monday. Both cricketers are in danger of getting long bans or suspensions as BCCI is trying to decide how the inquiry into the latest controversy should be conducted. Despite the apologies tendered by the duo, 10 BCCI units demanded a Special General Meeting to appoint an ombudsman for carrying out an inquiry. The call came after an evident difference of opinion in the Committee of Administrators (CoA) with regards to the action to be taken in the inquiry against suspended India players Hardik Pandya and KL Rahul. While CoA chief Vinod Rai has instructed the CEO to conduct an inquiry, Diana Edulji wants an inquiry done by CoA and the BCCI office-bearers. Brought back midway from the tour of Australia, Pandya and Rahul’s immediate fate hangs in balance with the World Cup less than four months away. Rai, in an e-mail to Edulji, said that the “BCCI is not in the business of ending young careers”. If the inquiry takes too long then they miss out on playing in IPL 2019 and even 2019 World Cup. BCCI has charged both players for misconduct and indiscipline and given them seven days to explain. Hardik Pandya has been heavily criticised on social media for remarks that have been widely condemned as sexist and inappropriate made on the show where he appeared with Rahul. Pandya had boasted about hooking up with multiple women and being open about it with his parents during the interview. Rahul was, however, a shade more restrained in his responses. The comments sparked a massive social media outrage with calling the remark ‘crass’ and ‘sexist’. It prompted the Indian cricket board to issue show cause notice to the duo. 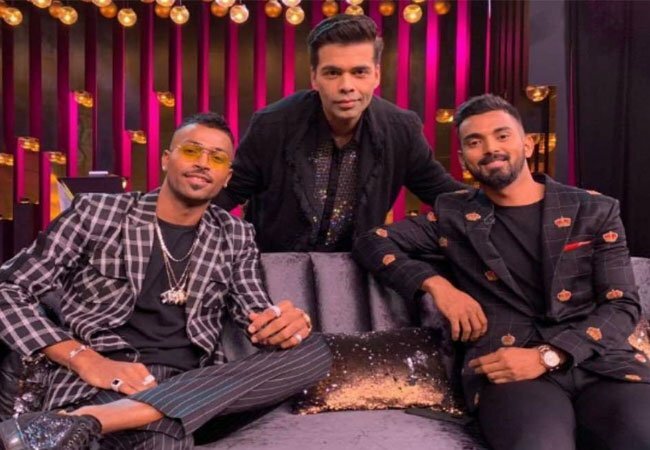 Cricketers Hardik Pandya and KL Rahul appeared on a celebrity chat show, hosted by film-maker Karan Johar, together. The show aired on TV last Sunday and featured Pandya and Rahul talking about their relationships, crushes, favourite movies, actors and actresses. 2. Virat better than Sachin? Hardik Pandya’s remarks were criticised as sexist, crass and cringeworthy. The allrounder was slammed on Twitter for “objectifying women” and being “unapologetically misogynistic”. Several people on social media people called out Pandya, Rahul and Karan Johar for the misogyny displayed on the show. As the outrage grew louder, Pandya took to Twitter to apologise for his comments, saying he got “carried away by the nature” of the show. “After reflecting on my comments on Koffee with Karan, I would like to apologise to everyone concerned who I may have hurt in any way. Honestly, I got a bit carried away with the nature of the show. In no way did I mean to disrespect or hurt anyone’s sentiments. Respect,” Pandya posted on Twitter. The Board of Control for Cricket in India (BBCI), however, was not satisfied with the apology. The Committee of Administrators (CoA) sent show cause notices to both the players hours after Pandya issued his apology on Twitter. The duo have been given 24 hours to reply to the notices. Hardik Pandya later offered “regrets” in response to the showcause notice from BCCI. However, it was regret and not apology was what Pandya offered in his reply. He also vowed never to repeat the behaviour.”I made an appearance on the chat show where I have made certain statements without realising that these could be disrespectful and offend sensitivities of viewers for which I am sincerely regretful,” stated Pandya’s response, “I would like to assure you that there was no malice or any sort of ill-intent on my part to offend anyone or portray any section of the society in bad light,” he added. India captain Virat Kohli condemned the comments made by Pandya and Rahul, calling them “inappropriate” and not supported by their team mates. “From the Indian cricket team point of view, any inappropriate comments that are made in that scenario are something that we definitely don’t support,” Kohli told reporters on Friday ahead of the first one-dayer against Australia. Indian cricketers Hardik Pandya and KL Rahul were suspended on Friday pending an inquiry ruling them out of the ODI series against Australia. CoA chairman Vinod Rai confirmed the suspension. A source in the BCCI said the two will be issued fresh show cause notices before a formal enquiry begins. The Indian team management is expected to take a call on whether they would want to keep the two with the team or send them back. KL Rahul and Hardik Pandya have been suspended pending an inquiry. The length of their suspensions is not known, but the duo look set to miss the one-day international series in Australia starting on Saturday and a limited-overs tour of New Zealand. The Committee of Administrators (CoA) asked the pair to explain the comments and Pandya apologised but after considering their reply, the BCCI decided to charged both players for misconduct and indiscipline. “The duo is now called upon to provide an explanation as to why they should not be proceeded against for misconduct and indiscipline under Rule 41 of the BCCI Constitution within a period of 7 (seven) days,” the BCCI said in a statement. On Saturday, CoA member Diana Edulji objected to BCCI CEO Rahul Johri doing the preliminary inquiry in the matter as there are sexual allegations levied on him. Edulji wrote in a letter, “In view of the grave sexual allegations levied on the CEO, it wouldn’t be justified if he conducts the inquiry. Its bad optics and the CoA will be criticized for it”. The two-member Committee of Administrators (CoA) is yet again divided and this time on how the inquiry into the latest controversy should be conducted. CoA chief Vinod Rai has proposed a quick inquiry into much-criticised comments made by suspended cricketers Hardik Pandya and KL Rahul but Diana Edulji fears it will be construed as a “cover up” job. 14. Will Hardik Pandya, KL Rahul miss World Cup, IPL 2019? If the inquiry takes too long or they get long bans then Pandya and Rahul are in danger of missing out on IPL 2019 and even 2019 World Cup. However, Diana Edulji said if that was the case then ‘so be it’. “Nobody is bigger than the game. Nobody is bigger than the institution.,” she was quoted as saying by The Mumbai Mirror. Hardik Pandya and KL Rahul, suspended for their controversial comments during a TV chat show, tendered “unconditional” apologies on Monday. Despite the apologies tendered by the duo, 10 BCCI units demanded a Special General Meeting to appoint an ombudsman for carrying out an inquiry. The call came after an evident difference of opinion in the Committee of Administrators (CoA) with regards to the action to be taken in the inquiry against suspended India players Hardik Pandya and KL Rahul. While CoA chief Vinod Rai has instructed the CEO to conduct an inquiry, Diana Edulji wants an inquiry done by CoA and the BCCI office-bearers. The inquiry into Hardik Pandya and KL Rahul’s much-condemned comments on women began on Tuesday as the duo gave their statements to BCCI CEO Rahul Johri. It is learnt that both players deposed via telephone after having tendered unconditional apologies in reply to the fresh show cause notices issued by the BCCI. This is just a preliminary probe as the decision over the main inquiry is yet to be taken.